Social Media Enthusiasts Holiday Party & Networking Event Free Food & Fun! 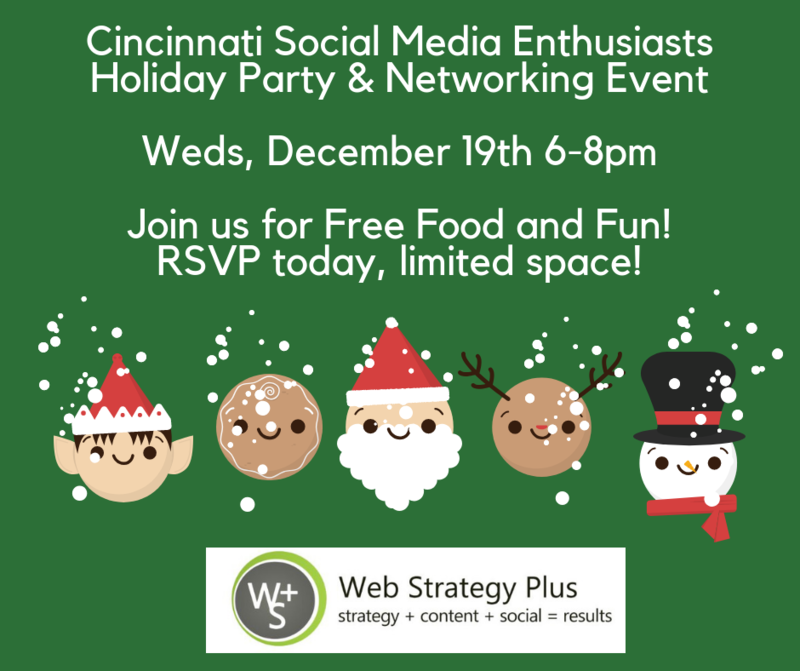 Join us for our Annual Cincinnati Social Media Enthusiasts Holiday Party & Networking Event! The Web Strategy Plus team is in the giving spirit so enjoy a free professionally catered full course dinner from The Village Pantry. Also, enter to win a free gift from Santa’s bag! We will be organizing fun networking activities to help you interact, meet and mingle with all your fellow attendees while having fun. Make great business connections to help grow your business in the New Year! Details for the full course menu coming soon. Get your RSVP in today, limited space available. Michelle Hummel (http://www.michelleshummel.com) is CEO of Web Strategy Plus a full-service digital marketing agency. She was recently nominated for the Woman-Owned Business of the Year! She’s a passionate Social Media Trainer with 15+ years of successful online business development, sales, and marketing experience. She also holds a valuable Internet Marketing Degree however with the ever-changing world of web marketing she strives to learn something new every day. She travels Nationwide visiting her 22 Social Media Enthusiasts Chapters delivering in-depth social media training. She also provides Social Media Certifications through founding Web Media University. (http://www.webmediauniversity.com) A current contributing editor to The Franchise Dictionary Magazine and she has written 3 books in her series called, “The Social Media Magnet: Everything You Need to Know to Attract Customers with Social Media”, where she shares her best-kept secrets to success. She also specializes in helping Franchisors and Franchisees develop an integrated web marketing program to drive leads. She’s available for interviews via email, telephone, Skype video, news segments on location and more.